Happy Kids Circle was created after the birth of my son, Matteo. As he was growing I realised that there is a need to create a space dedicated to children, their unique personalities and learning styles so that they can “Play, Learn and Grow” in English. Happy Kids Circle was born in 2013 out of a love for children and teaching English. The “Circle” aspect comes from the parents playing an important role and joining in on this fun learning adventure. We use authentic and engaging activities to capitalise on the children’s innate capabilities to create lifelong learning experiences. Children learn intuitively, the brain is at its best from the ages of 3 to 12 and we specifically stimulate the emotional brain because —learning is easier the more fun it is!! • small groups —where each child gets the required attention. • using only authentic, fun and stimulating material. 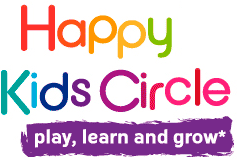 By joining Happy Kids Circle you are providing your children with a head start in life, cultivating a positive mindset and investing in their future through this exciting learning journey. There are 3 groups adapted to the child’s level and age: Happy Starters, Happy Jumpers and Happy Flyers.